A good podcast becomes great when mixed properly. Our team of mixers have worked on motion pictures, TV & radio and will seamlessly blend in intro / outro, breaks, sponsor messages to create tight podcasts for maximum effect. We mix to the podcast standard of -16 LUFS mono and export mp3 at 64kbps with ID3 Tags. 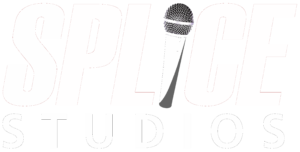 Last but certainly not least, Splice Cast takes care of hosting your podcast and syndication / distribution through the major podcast portals – Apple iTunes, Google Play, Spotify and more! LibSyn hosting for your audio with seamless links to your website. We also generate show notes and transcriptions for each episode. Yes! I want to know more about a turnkey podcast production service! Brands love the podcast format as it allows them to deepen their engagement with their audience. With a well-defined format and focus, brands can share their brand value and message within the intimate space that a podcast provides for direct connection. We offer full turn-key solutions to create a podcast that works for your brand and USP; choose a host, select guests, record, mix, and produce a podcast that connects with your audience. We also consult you to build your own podcast recording area on-site in your office and provide services and post production / syndication support to give you ultimate flexibility on how you produce your own podcasts Splice Cast's team of experienced producers will keep your podcast on track, on schedule and on budget and get your podcast to listeners regardless of OS, device or platform. I need a professional space to record and mix my podcast!